For The Evolution Of Marine Creatures, Bigger Is Better, Study Says : The Two-Way A new study published in Science looked at thousands of marine animals over a 540-million-year evolutionary span. Their conclusion: Most of them got larger. 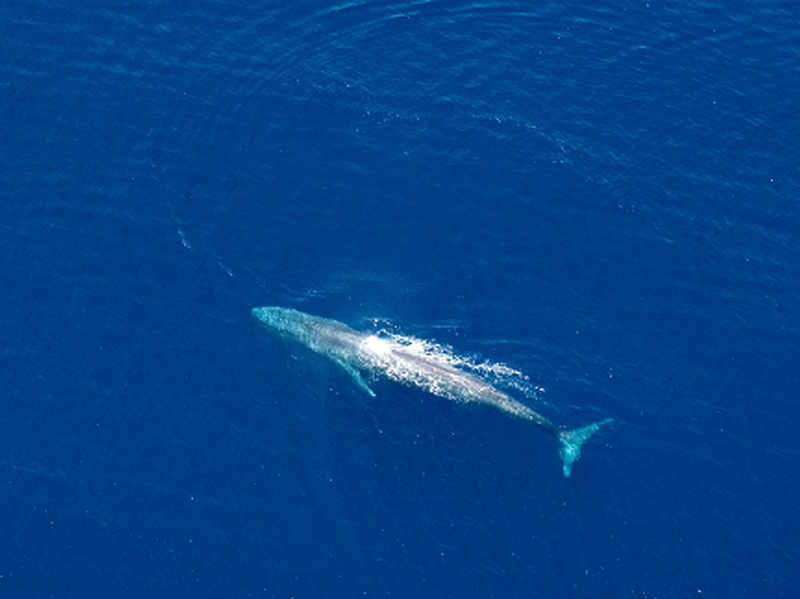 A blue whale is seen in Timor waters in an undated photo. The marine mammal buttresses Cope's rule, the notion that over the course of evolution, most animals tend to get bigger. For more than 500 million years, sea creatures have been getting bigger — much bigger as it turns out, according to a study by scientists who say that the evolutionary trend toward larger body size fits with a 19th-century principle known as Cope's rule. The rule, first posited in the late 1800s by Edward Drinker Cope, "states that evolution tends to increase body size over geologic time in a lineage of populations." "19th-Century paleontologists noticed that the ancient ancestors of modern mammals often tended to be smaller; horses, for example, can be traced to the dog-sized Eohippus genus of 50 million years ago. "The pattern is not consistent across the animal kingdom, however. Most groups of dinosaurs got bigger until they died out - but the birds that evolved from them grew smaller and lighter with the necessity of flight." The study's authors write in the abstract of their paper, published in the journal Science, that they looked at 17,208 types of marine animals going back 542 million years to a key evolutionary epoch known as the Cambrian: "Mean biovolume across genera has increased by a factor of 150 since the Cambrian, whereas minimum biovolume has decreased by less than a factor of 10, and maximum biovolume has increased by more than a factor of 100,000." In other words, the scientist looked at lots of marine animals over a huge evolutionary time span. Their conclusion: The small creatures got a little smaller and the big ones got a lot bigger. Think whales. The blue whale is not only the largest creature to currently exist on Earth, but also the largest known ever to have existed. "It's easier to eat other animals if you're large. It's also easier to avoid being eaten," Stanford paleobiologist Noel Heim, the lead author on the study was quoted by Reuters as saying. "In water, larger animals can be more active because of the increased mass relative to their surface area. They feel less 'drag' than small animals. Larger animals also have a higher metabolic rate, which also contributes to a more active lifestyle," Heim added. "To some extent this may seem inevitable: if life starts small, the only way to go is bigger. And although evolutionary biologists are always wary of narratives of 'progress,' many innovations in evolution require a large body size – for example, the smallest vertebrates are inevitably larger than the smallest invertebrates, because it takes a certain size of organism to pack in all the stuff that vertebrates have. "Likewise, warm-blooded marine animals like whales can only stave off hypothermia if they are more than about a meter long. So the re-invasion of the seas by the ancestors of today's marine mammals imposed a new hard boundary on the minimum size within this group, which in turn affects the average size across groups." The study's authors also point out yet another reason that air-breathing whales occupy the "big" niche in the marine environment. They "were the first mammals to evolve a marine lifestyle and have occupied the largest marine body sizes since they first invaded the oceans during the Eocene " 48 million years ago. "Air breathing ... can explain the rapid and widespread attainment of large size in marine reptiles and mammals. Relative to water, air has 20 to 30 times the concentration of O2, is up to 100 times less viscous, has diffusion rates of O2 through membranes that are 300,000 times faster, and is about 1000 times less dense," the study says.